Shot of one of my sessions. It worked for me. Acupuncture is a type of therapy that is thought to have originated in China well over 5000 years ago, in which it is built around the suggestion that health is actually determined how Chi flows through the body – where Chi describes the vital life energy that is found within all living organisms. But by inserting very thin needle at certain points within these meridians, acupuncture is though to redirect and improve the flow chi throughout the body, reducing pain, tension, and discomfort. 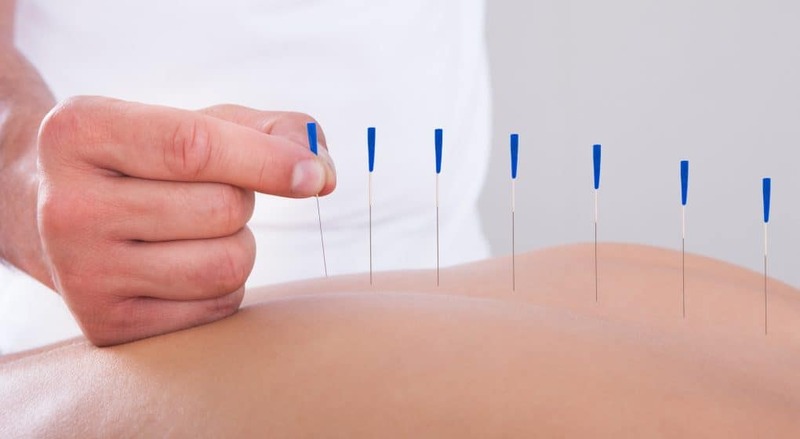 With all this in mind, dry needling and acupuncture are both very similar in their application – but the rationale does differ somewhat. 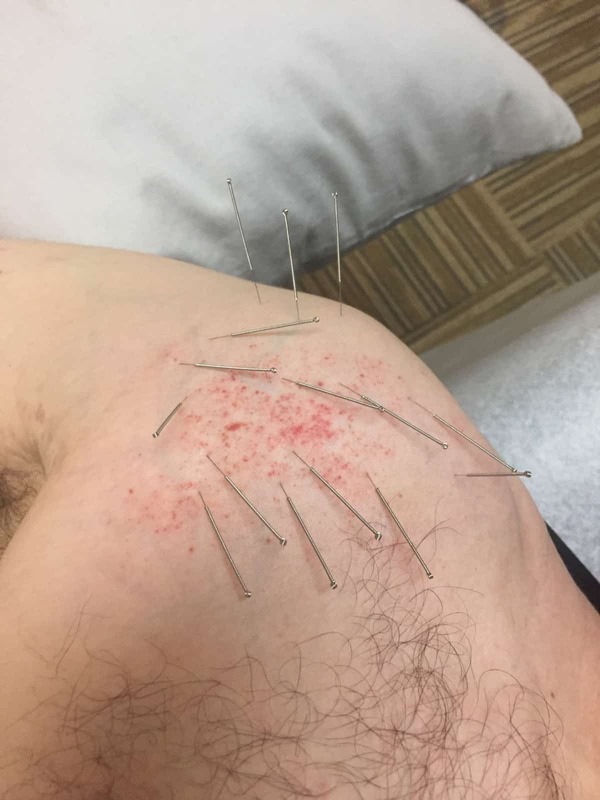 As a result, dry needling tends to be used more locally to the areas of pain and tension, while acupuncture is used on various spots around the body . Massage is one of the most common forms of muscle therapy on the entire planet, where it is suggested to reduce tension and improve the health of muscle tissue. Performed by applying firm pressure to the muscle tissue and actively ‘working’ on tight sections of muscle, massage has been shown to enhance blood flow, lower the neural tone of hyperactive muscle tissue, reduce tension, and even aid recovery after exercise . The Graston Technique is a specific and patented form of manual therapy that actually uses stainless steel tools to treat muscular dysfunction. Similar to traditional manual therapy, these tools are moved over the skin and muscle tissue to break up any scar tissue within the tissue, thus restoring muscle function . This electrical current is thought to stimulate the nerves within the muscle tissue, causing them to relax. This is also said to cause an increase in endorphin secretion throughout the body, which can blunt pain signals within the brain . While the American Physical Therapy Association does state that Dry Needling is well within the scope of practice for a regular Physical Therapist, ther are some specific US states that have rules and regulations that do not permit it. Additionally, despite dry needling being both approved and recommended by the Americal Physical Therapy Association, as it isn't approved in every state it also isn't covered by every single health insurance fund as many consider it a form of investigational medicine, rather than an effective treatment option. Headaches and migraines are often the result of tension caused by tight muscles around the cervical neck and upper back. With this in mind, dry needling has been shown to be extremely beneficial when it comes to treating these tension type headaches, as it has the capacity to reduce the tone and tightness within these specific muscles . In a very similar fashion to the above point, many shoulder issues are caused when the key muscles that act upon the shoulder joint become tight and dysfunctional. As a result, the application of dry needling to those muscles has been shown to assist in the treatment of shoulder pain in both the short and medium term, although these benefits are not significantly greater than those observed with traditional physical therapy treatments . Taking this into consideration, dry needling may have the potential to restore normal joint function and reduce bursa irritation. This, in turn, may reduce the inflammation and pain associated with bursitis by helping treat the source of the problem . Low back pain is one of the most common musculoskeletal issues ion the planet, affecting nearly 90% of the population at one point in their lifetime. Fortunately, the application of dry needling has been shown to cause a significant reduction in low back pain in the short term, while also offering an effective treatment option in the long term as well. This appears to hold true for both non-specific low back pain, and back pain driven by sciatica . There is evidence to suggest that dry needling can offer an effective treatment option for people suffering from TMJ disorder, causing significant reductions in pain in conjunction with large improvements in function . Interestingly, some research has shown the dry needling may offer an effective treatment for plantar fasciitis, causing significant reductions in pain combined with large improvement in function . Dry needling has been suggested to act as an effective treatment for piriformis syndrome, as it has the capacity to reduce the tightness of the piriformis muscle, thus reducing pain and discomfort . There is a small amount of research to suggest that dry needling may help reducer some of the muscle pain associated with shin splints, but it does not appear to offer an effective treatment option on the long term unless it is combined with rest (allowing the tissue some time to heal) . It is also important to note that while there is no evidence to suggest that dry needling is unsafe for pregnant females, we believe that it should be avoided in the first trimester of pregnancy, as miscarriage is fairly common within this time of development. If you have had any experience with dry needling at all, we would love to hear about it – so drop us a comment and we will get back to you ASAP!